Here's an interesting theory that I tend to agree with. The US unemployment rate climbed as rapidly as it did because unemployment benefits were extended. Other countries with sharper declines in GDP fared better. Why did the unemployment rate rise so rapidly -- from 7.2 per cent in January to 10.2 percent in October? It was clearly the administration's "stimulus" bill -- which in February provided $40 billion to greatly extend jobless benefits at no cost to the states, says Alan Reynolds, a senior fellow with the Cato Institute. And from the same source today a report about the jobs apparently created by the stimulus is riddled with errors. The acting head of the Government Accountability Office (GAO), Gene Dodaro, told the committee his investigators found 3,978 reports where recipients reported creating a total of 58,386 jobs without spending any money. Another 9,247 reports covering $965 million in spending listed no jobs created or saved. So what is the overall outcome of government intervention in the labour market? Increased unemployment and wasted taxpayer money. The Children's Commissioner is telling people to boycott the March for Democracy, to be held in Auckland tomorrow. An indicator of the level of his arrogance is that he doesn't realise his decree will actually have the opposite effect to what he wants to achieve. He actually believes that the people will do as they are told if he speaks out. Why? What especial wisdom and beneficence does Mr Angus possess beyond mere parents? “If the existence of the office of the Children’s Commissioner was put to the democratic vote, it would be gone by lunchtime,” says Mr McCoskrie. March start: Queen St/Fort St corner, 1.30pm. Transport: Free buses from noon from Constellation Drive park and ride (North Shore), Campbell Cres entrance to Alexandra Park and along Tamaki Drive. Songs and speeches: Outside Town Hall, about 2.30pm. Event ends: About 3pm. Free buses from Britomart from 3.30pm. This is appalling bias on the part of the NZ Herald. Update; The Herald pulled the description. It hadn't been my imagination though. I rang talkback to express my anger at the Herald for such an explicitly biased moniker and the host had seen the same piece and had a similar reaction. What exactly is Whanau Ora? Here is an exchange from parliament Wesnesday. It does not serve any purpose. Nobody is any the wiser from listening to or reading it - politician or member of the public. It only serves to increase the suspicion that National and the Maori Party either don't know what they are doing or don't want us to know what they are doing. Development and Employment: What definition, if any, did her Associate Minister Hon Tariana Turia provide to her to explain the purpose and intended outcomes of the Whānau Ora programme? Hon PAULA BENNETT (Minister for Social Development and Employment): I have had many discussions with Minister Turia on the definitions of Whānau Ora. The member does not understand that it is not a programme; it is a way of working that leads towards positive outcomes for whānau independence and positive well-being. Frankly, the integrated provision of health, education, and social services for all New Zealanders is something Labour talked endlessly about but never accomplished. This Government is working towards it. Hon Annette King: Does she stand by her statement that she does not envisage carving off a billion dollars to go into that sort of scheme; if so, where will her Associate Minister get the billion dollars she has claimed to fund the Whānau Ora programme? Hon PAULA BENNETT: We are still working through developments on how that programme will come together. I can say that is looking really positive. What I have said is that, under Labour, welfare dependency increased; sickness, invalid, and domestic purposes benefit numbers went up; and abuse and neglect of children increased. What Labour did in the past did not work; Whānau Ora has the potential to work. Mr SPEAKER: Is the Minister deaf? I called for order several times. She continued to give an answer that was absolutely irrelevant to the question asked. It is unnecessary. Hon Annette King: Does the Minister agree with her Associate Minister that “to be quite frank with you there’s probably a billion dollars already being wasted now”? If so, what programmes or initiatives is her ministry wasting millions of dollars on, and will these programmes be cut to make way for the new Whānau Ora programme? Hon PAULA BENNETT: We are looking at value for money for every taxpayer dollar that this Government is putting in, and we make no apologies for it. I tell members that our ministries are excited about the prospect of Whānau Ora, this Government is excited about the prospects of whānau ora, and we believe that it can make a positive difference for all families, and we will continue to work towards that. Hon Tau Henare: Was does the Whānau Ora taskforce say about the current delivery mechanisms and the outcomes for Māori? Hon PAULA BENNETT: The taskforce discussion document states: “Despite Government investment across a number of sectors the results for whānau are often disappointing.” It continues: “The taskforce is not convinced that whānau and taxpayers are getting value for money, or that the efforts of Government are matched by the measurable gains for whānau.” That is what we need to address. Hon Annette King: What has she done to convince her Government colleagues to now support separate and identified funding for Māori service provision, something that members opposite opposed when in Opposition and called race-based funding; and how did she convince Tony Ryall to agree to the Whānau Ora programme, when he only a short time ago said that race-based funding had to come to an immediate end? Hon PAULA BENNETT: What that member does not recognise is that Whānau Ora has the potential to be good for all families, for all New Zealanders. Through a different delivery mechanism we will see positive outcomes; we will see changes that we did not see in the 9 years of the Labour Government, which just piled programme on top of programme. Te Ururoa Flavell: Tēnā koe. Kia ora tātou. Kei te hāngai pū te Whānau Ora ki ngā ratonga hauora, ki ngā ratonga whakahiato ora, noa iho? Hon PAULA BENNETT: No. 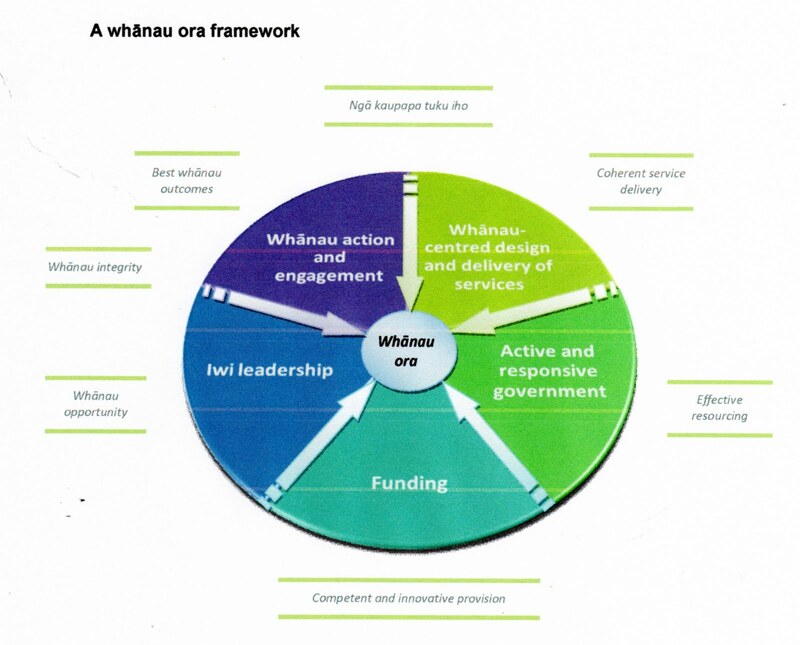 Whānau Ora is focused on re-empowering families to take responsibility for themselves. It is about the contribution that iwi, hapū, communities, and extended whānau make to family outcomes. Māori economic development contributes to Whānau Ora, as do the services associated with health, social services, housing, justice, the community and voluntary sector, and education. Mr SPEAKER: Dr Rajen Prasad. [Interruption] I apologise to the member, but if his own frontbench colleagues would only be quiet, so that we could hear the supplementary question from Dr Rajen Prasad, I would be obliged. Te Ururoa Flavell: I raise a point of order, Mr Speaker. As the person who asked the question, I unfortunately did not catch pretty much half of the delivery from the Minister. I just could not hear it from here. Is it possible to have a rerun of the end part? I did not hear it. Mr SPEAKER: In fairness I—[Interruption] A point of order is being dealt with. I do not know what was in the lunch that some members had today. [Interruption] Has the Hon Paula Bennett quite finished? I say to the honourable member that I could hear the Minister’s answer reasonably clearly. Dr Rajen Prasad: Did she see the reported comments at the weekend from her Associate Minister, the Hon Tariana Turia, that the Minister’s views on the “whānau first” policy, a key aspect of Whānau Ora, are hugely controversial; if so, what discussions has she had with her Associate Minister, and have they decided which social services will be covered by the Whānau Ora interventions framework? Hon PAULA BENNETT: Actually, that statement was factually incorrect. What I can tell the member is that we have some real challenges ahead of us as a country on how we deal with our abused and neglected children. Hon PAULA BENNETT: Sorry, what was that? The member does not see it as being important? Carmel Sepuloni: You heard me. Hon PAULA BENNETT: Has she got a problem with that? Mr SPEAKER: I ask the House please to come to a little more order today. It is not very tidy at all. What happened—in answer to the honourable member’s question—was that the Minister simply disagreed with the statement contained in the member’s question. I think she then felt that she had continued on for long enough. So I think the matter was dealt with. I was just waiting for the House to settle down. Hon PAULA BENNETT: Actually, it was I who said it was hugely controversial. Mr SPEAKER: I am on my feet; I just do not know what has got into members today. Where the member asking a question inserts a statement into the question, and the Minister refutes the statement, the question has been answered—because the Minister has refuted the statement. It cannot be litigated by way of point of order. Hon PAULA BENNETT: Of course I do. Whānau Ora has the potential to transform whānau in an unprecedented way. It is consistent with my goals—and this Government’s—of having service providers working together more effectively for whānau. I also strongly support anything that encourages families to take responsibility for themselves. 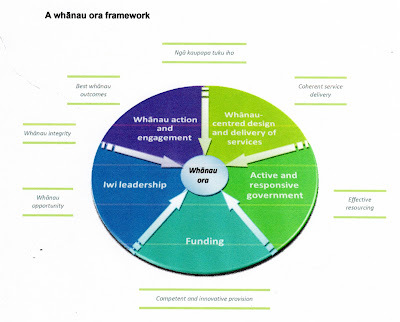 If, like me, you are still dissatisfied with your understanding of what whanau ora actually means in concrete terms the following, lifted from the discussion paper prepared by the whanau ora taskforce, will probably raise your blood pressure even further. No doubt people are being paid thousands of dollars to turn out this stuff. A few days back I mused about why Labour isn't attacking the government over youth unemployment. Mainly because (I had to explain in a second post) parliamentary attacks create headlines and headlines are the heartblood of politicians. 2. Hon ANNETTE KING to the Minister for Social Development and Employment: Does she believe that the Government’s package to address unemployment has done enough to give youth a firm footing in the labour market? As I said, 16.8 percent - one in six - 18-24 year-olds was unemployed at the end of September. What is there left to say about the 'mysterious' deaths of some babies in NZ? 'Mysterious' does not refer to SID syndrome, though there is sometimes an uncomfortable uncertainty over what is or isn't genuinely described as such. No. The reference is to the mystery created by a person or people who lie to protect themselves or others. Partly, I suspect, this is another symptom of the racial victim-hood some people feel. Closing ranks is, in their minds, morally justifiable. Of course, this strategy isn't confined to Maori, as we have recently seen. Lying, especially where benefit incomes and accommodation supplements are involved, is a well-established pattern of behaviour anyway. Work with people like this and you even start lying to yourself as well. It's an occupational hazard. Trying to cross the divide between two sets of morality is fraught. But if no attempt is made we may as well shut up shop now. But there is one blinding, unavoidable question about the case of Staranise Waru. Had she lived she would now be four. Why the hell did it take the coroner three and a half years to deliver a result? Another protest in Wellington today - another I won't be joining. As women are paid on average less than men, somebody has calculated that women on average are working for nothing from November 18 each year. Because they claim to be subsidising the economy to the tune of $4 billion they are going to make out an invoice for said amount and hand it over. And who will it be made out to? Treasury should be on the list because it oversees the economy. The PM because he leads a National government that refuses to consider pay equity issues at select committee. And of course the Salaried And Waged Men Of New Zealand who we all know have been ripping women off for centuries by taking more than their fair share of the cake. Um. Without trying too hard it isn't difficult to come up with some invoices that might be handed back. If they want to talk about "subsidising" and "the economy" none of the above invoices are any less absurd than the one that will appear today. But reducing the discretionary dollar won't worry these guys who are deep into the taxpayer's pocket already via government funding. Perhaps they are sensing that Sir Geoffrey and the law commission need some support for their draconian ideas and have also figured calling for increased alcohol tax will curry favour with their biggest benefactor - the government. After all it is the government that stands to gain the most from increased tax. Salvation Army welfare centres have seen a growing number of families coming to them citing alcohol abuse and addiction as a leading cause of poverty and domestic violence in their lives. People can be as self-destructive as they like when the government guarantees a pay cheque not contingent on work. Perhaps the Salvation Army should be thinking about that. When William Booth launched the Army on its mission, the three greatest social evils were poverty, homelessness and unemployment. He, like his hero John Wesley, saw that the Kingdom of God has as much to do with this world as the next. The famous Cab Horse Charter resulted from Booth's observation that the London cab horses were provided with food, shelter and work; and he was determined to ensure that these most basic of needs were provided to all people. Booth also recognised that work was a critical factor in human worth. His great scheme for social and spiritual regeneration has as its keystone ‘work for all'. Under proposal, in the UK, is a personal carbon allocation. People will be tracked by ID numbers and sent statements describing their liability if they exceed allocations. * It would involve people being issued a unique number which they would hand over when purchasing products that contribute to their carbon footprint, such as fuel, airline tickets and electricity. * As with a bank account, a statement would be sent out each month to help people keep track of what they are using. * If their "carbon account" hits zero, they would have to pay to get more credits. * Those who are frugal with their carbon usage will be able to sell their unused credits and make a profit. Under the Climate Change Act, Britain is obliged to cut its emissions by 80 percent of 1990 levels by 2050. This means annual CO2 emissions per person will have to fall from about 9 tons to only 2 tons. So wouldn't the allocation be well under what the average current consumption is? Even existing low consumers would struggle to stay within limits. But that assumes that each individual is given the same allocation. What if allocations were progressive according to income/ ability to pay? Then there would be a grand opportunity for the 'poor' to profit from the 'rich'. Another glorious state wealth redistribution scheme would be achieved. On Saturday I blogged about the fundamental difference in views between the Minister and associate Minister of Social Development re the placement of Maori children removed from high risk situations. Another looms. Taken at their word, National has said they are now going to press ahead with work-testing the DPB when the youngest child turns 6. But the Maori Party is completely opposed to this. One third of working-age Maori women are on welfare - most, the DPB. Which legislation will actually have more practical impact on Maori? Enshrining customary right to the foreshore and seabed or making Maori mothers get a job? So what, you may say. ACT will support the legislation allowing the Maori Party to vote against it. But what if ACT sees this as a golden opportunity to push National further and, for example, introduce a cap on the number of children eligible for assistance or a time limit on DPB receipt (note to Sir Roger), then the Maori Party could be pushed into supporting the legislation as it stands. Or they could continue to hold out, leaving ACT having all the influence. They would be between a rock and a very hard place. This is exactly the sort of stuff that is causing friction amongst Maori Party members. In a way I sympathise with Hone and his philosophical antipathy towards National. I feel a similar antipathy and didn't want ACT to go into government with them. But that is water under the bridge now. And ACT, (note to Sir Roger), has a chance to actually do something important on the welfare front. The Ministry of Social Development posted its annual report on Friday. It may not be intentional but website postings are nearly always made on a Friday when media are less attentive. We have around 300 sites that provide services to more than 1.6 million people. About half of the adult population. The number of jobseekers and beneficiaries grew dramatically during the year and the Unemployment Benefit numbers increased by 187 per cent. There were also significant increases in the Sickness, Invalids and Domestic Purposes Benefit numbers. In the first six months of 2009, approximately 1.15 million people attended appointments and seminars and we handled 3.4 million phone calls asking for advice or for our help. Lots of recession-induced calls no doubt supplemented by a large dollop of 'learned helplessness'. At the same time hundreds more young mothers will have been admitted into the system with a child as a meal-ticket to a life of handouts. South Auckland bucked the national decreasing DPB trend between 2004 and 2008. At-risk youth hail predominantly, but not exclusively, from benefit-dependent homes. Yesterday Crusader Rabbit sent me a wonderful quote which seems the most apt note on which to end this post. Wellington barrister Robert Lithgow said the rise came from police putting more trivial matters before the court, which didn't justify the stigma of a conviction. "The courts are saying this is out of all proportion." That is right and proper. But while the court system is already so over-burden with serious cases, this required over-enthusiasm on the part of the police creates another problem of itself. People unnecessarily hauled before the courts and the ensuing considerable wasting of time and resources is the result of the ongoing anti-violence campaigns and, more recently, the anti-smacking law. There is an analogy about what government does with legislation. Trying to solve a problem (in this case family violence) is like squeezing a semi-inflated balloon. The air is simply moved from one area to another. Was this new problem covered off in the Ministry of Social Development review into how the anti-smacking law is working in practice? I don't think so.